It’s unpopular to say this, but I have ambivalent feelings about Museum station. 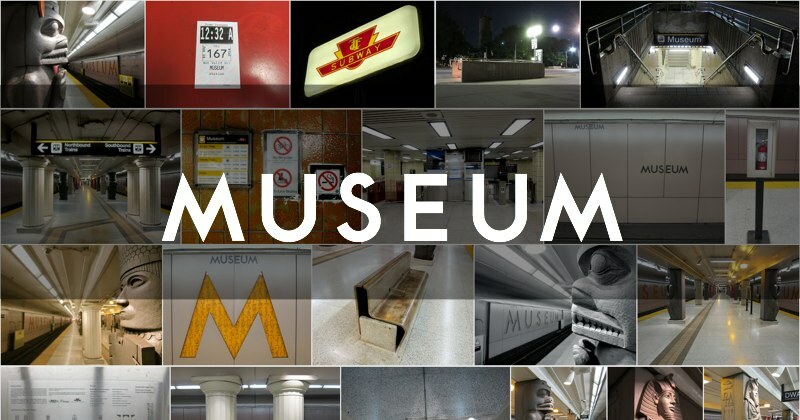 Or rather, about the 2008 renovations to the interior, in which reference is made to exhibits in the adjoining Royal Ontario Museum, for which the station was named. The overall effect is garish, though well-intentioned. The original platform design was clean, functional and sparse—almost a minimalist distillation of a TTC subway stop. It was a mistake, albeit an enthusiastic one, to re-clad everything in a kind of Disneyfied tourist anti-vernacular. Perhaps I lack imagination. Gazing down the central platform: a mishmash of allusions. The roof could have used more of a touch-up. First Nations: Wuikinuxv First Nation Bear House Post. From the vantage point of a child visiting the Museum for the first time, arriving via subway, the decorations might be viewed in a better light, as a tantalizing advance glimpse of treasures to be revealed next door. If I was 11 years old this would be so cool. Did the renovation improve safety by adding a needed 2nd exit? No. Did the renovation make the station accessible? No. Did the renovation improve the appearance of the station? No. In other words, we had an opportunity to actually improve Museum station, functionally. We spent all that money, used up all that political capital, and... merely dressed up some support columns. That’s a failure. I will grant the design one small victory: the platform level at Museum doesn’t have any advertisements. at the south end of the station. The bars were added after a 1982 police survey warned that muggers could linger in this area of the station without being seen. Museum station opened February 28, 1963 as part of the University line. The station’s concourse level also functions as an underground crossing point for Queen’s Park. Serious transit fans can explain the elaborate wye junction that connects this station to the Bloor-Danforth line (in particular the ‘abandoned’ Bay Lower), and expound on the history of its operation. P.S. No, there isn’t a phone booth at that spot in real life.